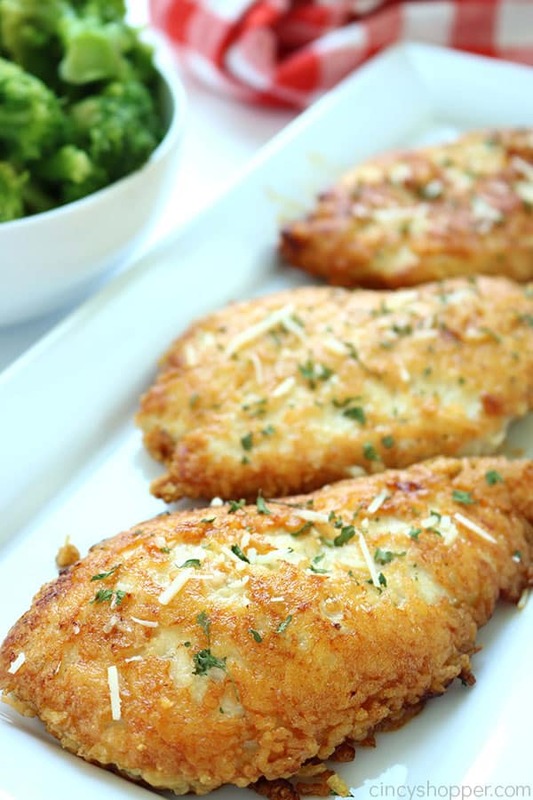 This Parmesan Crusted Chicken is an easy meal idea. 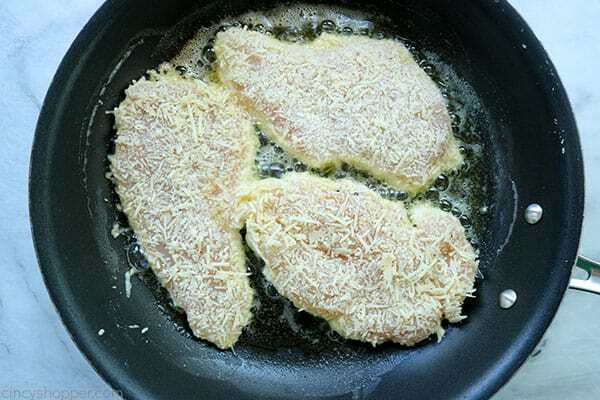 We use pounded thin chicken breasts, coat in a delicious Parmesan coating, and then fried to make them crispy. 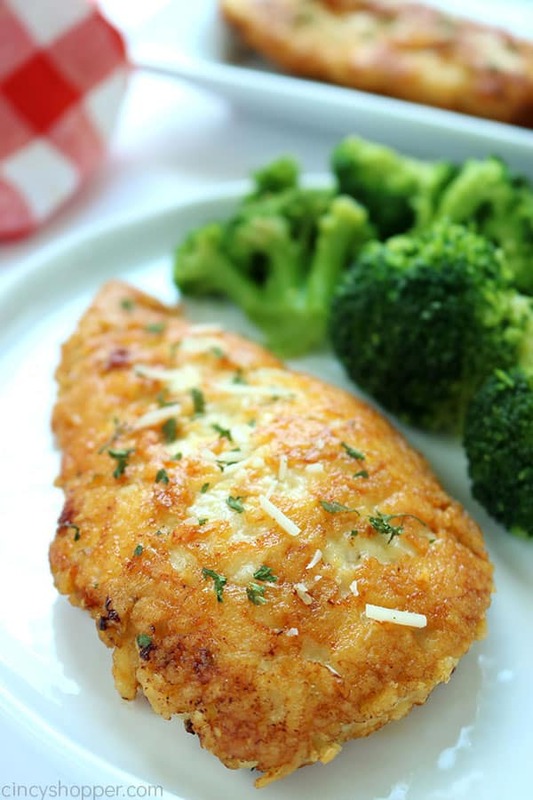 Add this chicken idea to your dinner this week. 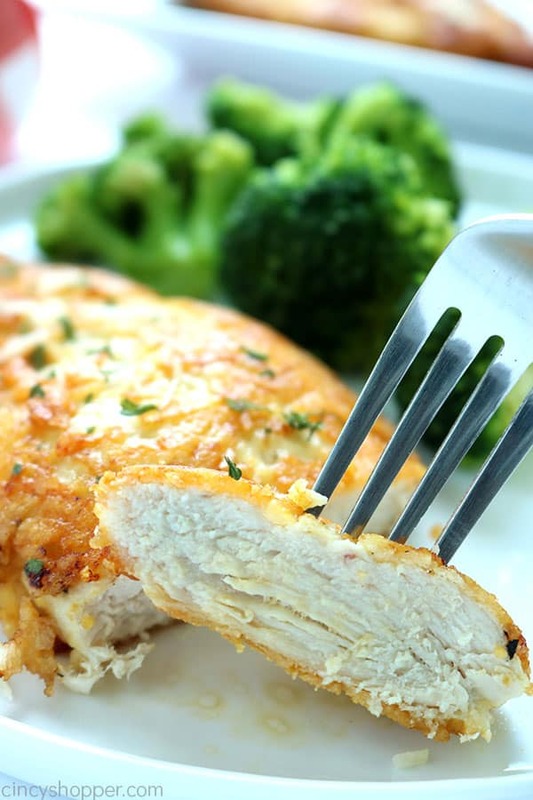 Tired of the same old chicken breast recipes? 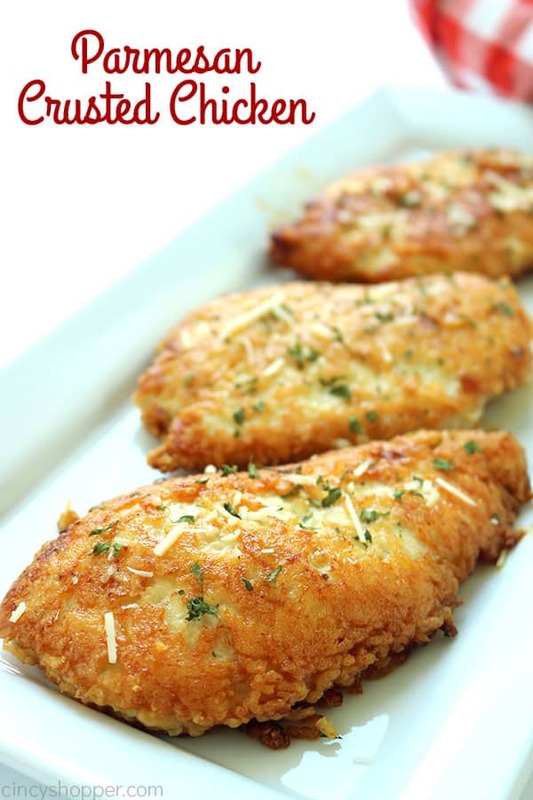 If so, you are going to want to make this Parmesan Crusted Chicken recipe. I normally make chicken recipes for dinner a couple of times per week. My family loves it when I make some of our favorites like Easy Chicken Pot Pie Casserole or our Red Hot Chicken. Those are go to chicken recipes. Lately, I have been trying to introduce some new chicken recipes. I always find chicken breasts for a great price at Kroger. So last week, I made our Potato Chip Chicken that the entire family really enjoyed. I made it again the very next evening with sour cream and cheddar chips and it was also a hit. I never use to pound my chicken to make it thinner. I have changed my ways. When I butterfly our chicken breasts and pound them flat, they cook so much quicker. When we have a busy evening, time saving recipes are always a must. For this Parmesan Crispy Chicken, the pounding method saves me from spending way too much time in the kitchen. I knew this chicken breast recipe was going to be a favorite with my family. They love crispy coated chicken. Every one of them came back for seconds. I am super happy to have another chicken recipe to add into our dinner rotations. 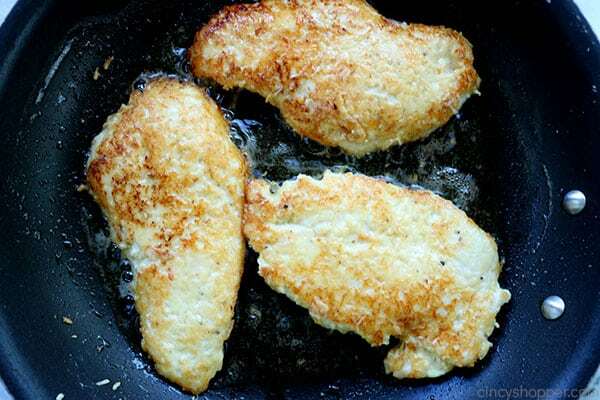 The breasts fried so perfectly. They all kept their coating because I was careful to allow them to get cooked well before attempting to even peek at them. If you attempt to peek and flip them too soon, the coating will not stick to your chicken. 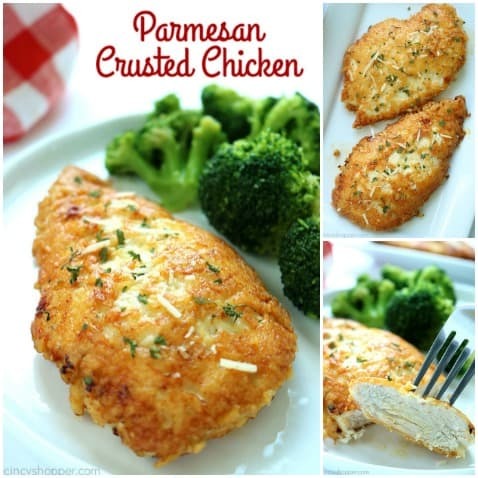 Be sure to wait until you know the parm has had enough time to cook on to your chicken. 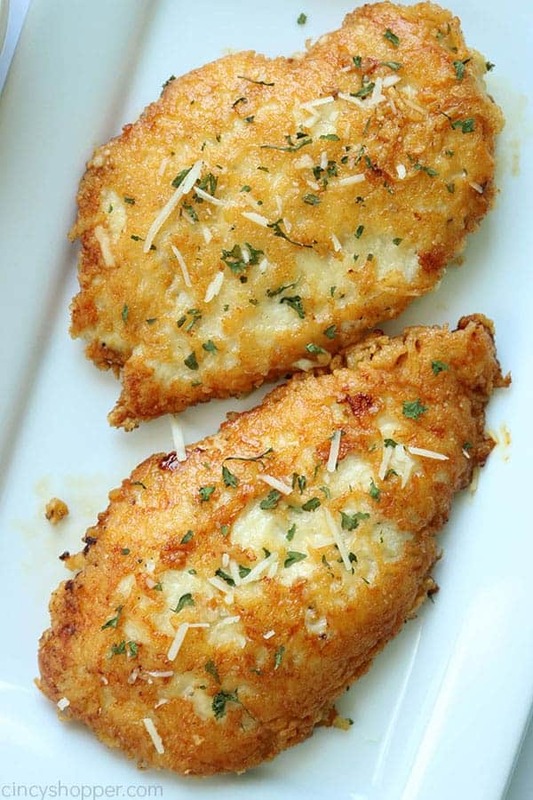 This Parmesan Crusted Chicken requires only a few ingredients. It makes for a super simple weeknight meal. Be sure to use shredded Parmesan cheese. Grated Parmesan will NOT work. I used butter to coat my pan. 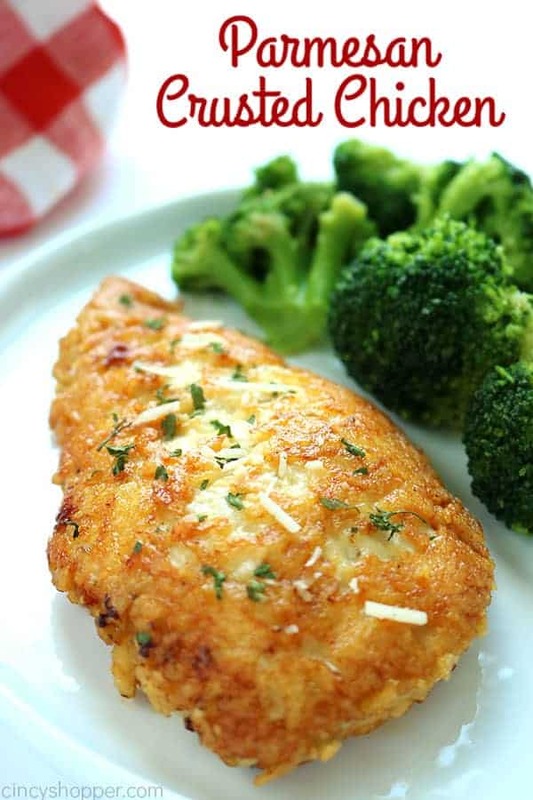 The butter really adds a great flavor to the chicken and allows it to cook so perfectly. 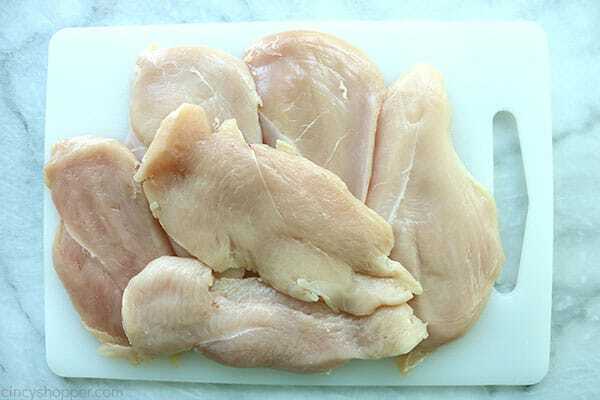 Cut each breast in half and pound to about 1/2″ thick. 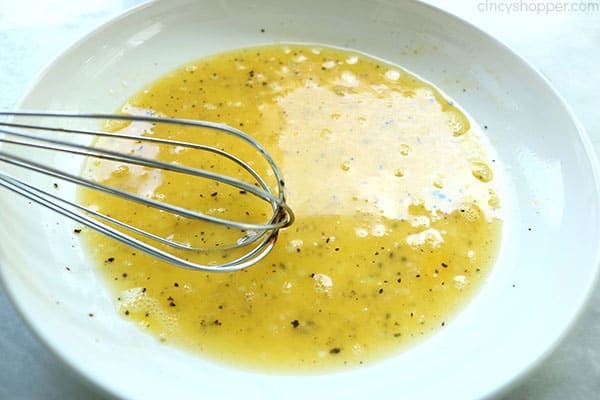 Beat egg and water in a shallow bowl until blended. Add garlic, salt and pepper and whisk to blend. Place parmesan in another shallow bowl. 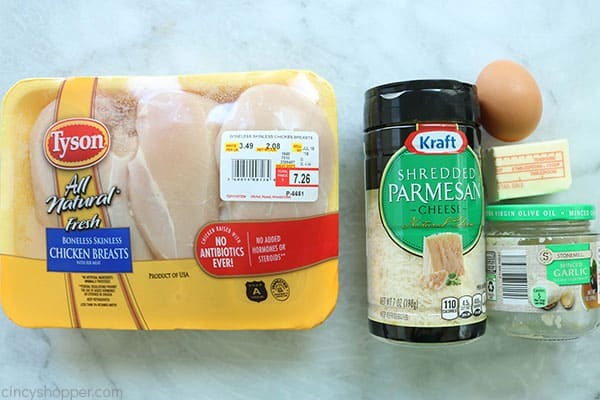 Dip each piece of chicken in egg mixture making sure to coat. Allow excess egg to drip off. 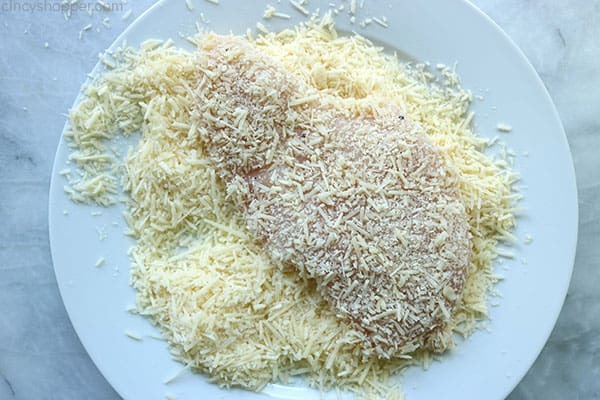 Place in parmesan. Sprinkle more parmesan over top. Gently press, then turn and repeat on other side. Shake off excess. Repeat with remaining chicken. Place butter and oil in a large skillet over high heat. 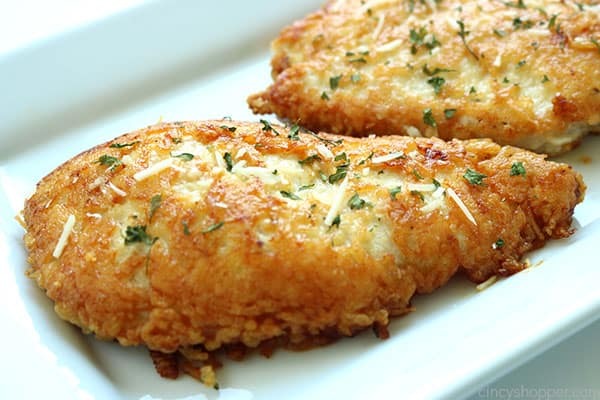 Place chicken and do not move until edges brown (so that cheese sticks to chicken, about 3 minutes). Lightly press with spatula then turn over and again do not move until browned. Lightly press with spatula and remove to serving plate. 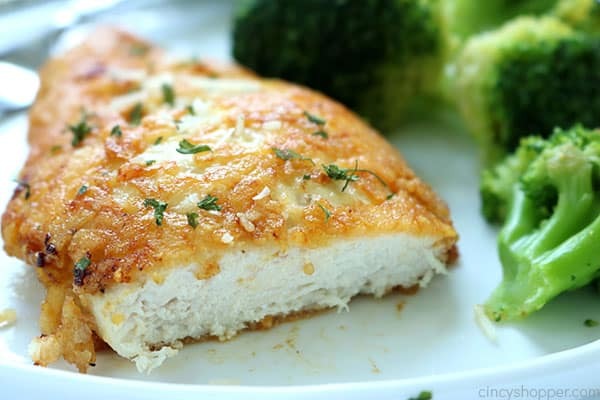 Do you have a favorite chicken breast recipe that you make frequently? Cut each breast in half and pound to about 1/2" thick.